Eddie is a three year-old Sussex hen that is part of a small flock of three chickens kept as backyard pets in Melbourne, Australia. All flock members, including Eddie, were suspected to have fowl pox by their owner. Eddie, however, appeared to be the most adversely affected of the three birds---which worried her human, thus she decided to bring Eddie to see the veterinarians at Bird Vet Melbourne (BVM). Eddie had started to moult just a few weeks prior. Since the start of her moult, her human had noticed that Eddie had completely stopped laying eggs. In addition, Eddie also looked like she may have lost some weight, however she still maintained her normal appetite and amount of water intake. Eddie and her other flock members received a daily diet of layer pellets, combined with some mixed grain. All members of the flock were provided daily access to forage on plants and scratch at soil in the garden. The flock was also provided with whatever table scraps left over from their human’s meals---usually consisting of various types of fruit and vegetables. All members of the flock were administered wormer medication via water on an annual basis. 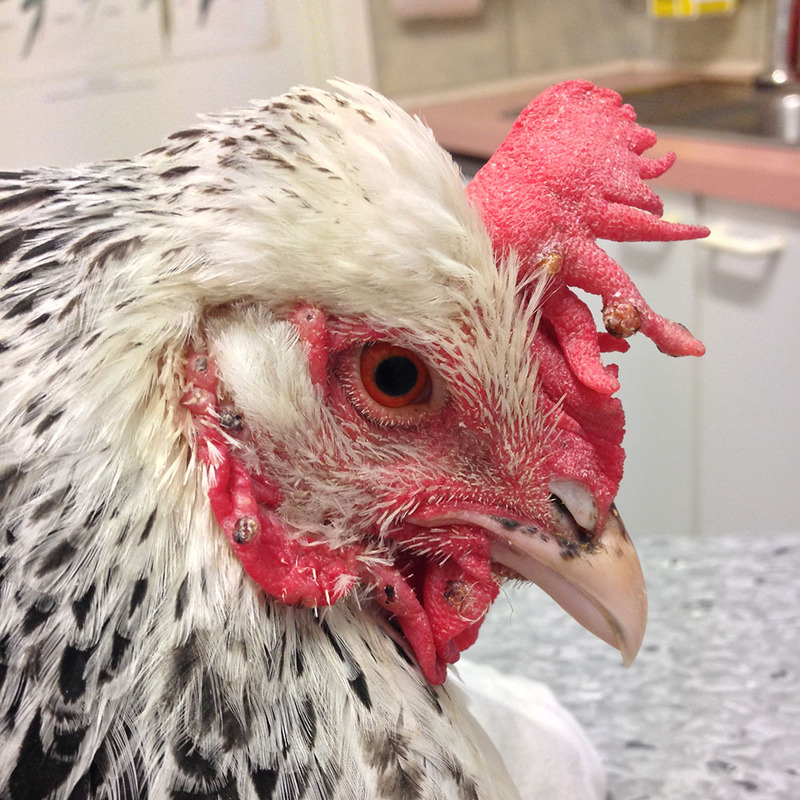 Upon examination, Eddie presented with multiple raised nodular scabby lesions on her comb and wattles. She was also confirmed to still be in moult, however was otherwise healthy. The presentation and location of the lesions were consistent with the dry (cutaneous) form of the poxvirus—which results in the disease known as Fowl Pox. Dry pox lesions develop on the unfeathered parts of the bird, such as the beak, eyelids, nostrils, comb, wattles, legs, and feet. Fowl pox in birds is actually related to chicken pox in humans--they are both caused by a poxvirus, from the Poxviridae family. Poxviruses have a reputation for causing skin lesions—or ‘pustules’ to be specific. Fowl pox is a highly contagious, slow-spreading disease that is often able to maintain a presence in the flock’s environment for several months to years. Susceptible birds become infected with the virus through ingestion, inhalation, and direct contact with contaminated objects (nesting material, dirt, feeders or waterers, perches, etc.) or aerosol particles. 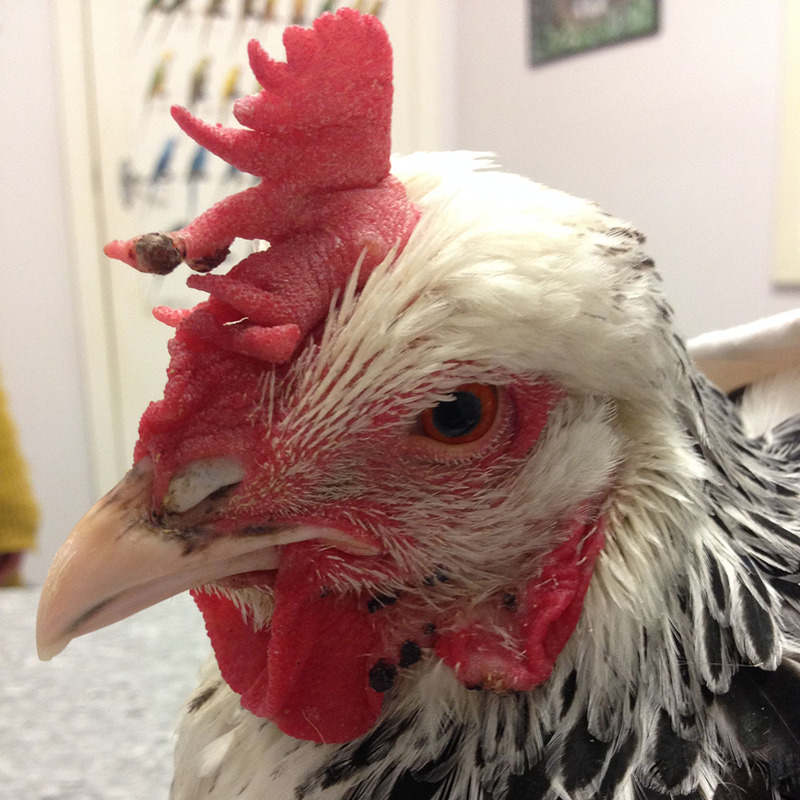 Arthropod vectors (such as mosquitoes) also spread the fowl pox virus through feeding on an infected chicken and spreading it to the others when it bites. The latter is suspected in Eddie's case. Pox virus lesions are usually self-limiting, and may remain for up to 4 weeks, taking a week or two to decrease in size and eventually fall off. Some birds become very unwell with the disease and require supportive care and medications, whilst others can be minimally effected. Eddie was prescribed anti-inflammatory medication for pain (Meloxicam), Clavulin (an antibiotic useful for treat a wide range of bacterial infections) to help prevent any secondary bacterial infections, and a moulting aid supplement. BVM provided Eddie’s owner with consultation regarding recommendations for future preventative health care of the flock (including worming and mosquito prevention), in case of secondary underlying issues. If upon discharge from the hospital, Eddie showed any signs of decreased appetite, in-patient management of Eddie was recommended to allow assisted (tube) feeding into Eddie’s crop. Thankfully, there were no complications, and Eddie and the rest of her flock fully recovered from their fowl pox outbreak.